Housekeeping: the 9th episode airs this week, so I'll try to post a few episodes per week to catch up, but I'll be unreliable for the next two weeks. On the episode: I haven't read the comics (yet - but I posted the Books Included copy of the first episode discussion to cover the bases), but I'm into the show. After getting hooked on SyFy's Z Nation, I'm now biased towards their brand of dramatic television. They realize they're not super serious, and embrace that. The actors are all good in their roles, and characters are all fun, interesting, and flawed. I didn't read the comic book but I have been enjoying the show. I too appreciate Syfy's lighter dramas and knowing this was from the producer (showrunner?) of Lost Girl also helped sell me. The Calgary scenery is appropriately bleak and Western, and the main four cast members are good looking and charming. It's not the tightest or most compelling TV evar, but I'll for sure be watching through the end of the 13 episode season. Oh man. I just looked up the comic book. Let's just say I'm seriously happy the TV show redesigned Wynonna and her wardrobe. Oh, this somehow never got on my radar, but I love a good weird western. Will have to check it out. Thanks, Filthy Light Thief, thief of filthy light! I've been watching all season, but I may have to re-watch to be able to comment on any thread, it's all a bit of a jumble now, and I'm still a little confused on the show rules about the revenants. 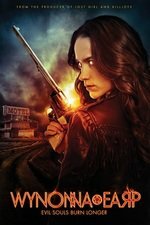 Super late to the game - I saw an interesting actress in S6 of Letterkenny* and looked up what else she did and Wynonna Earp showed up with her as the titular character. Gave the show a pass the first time around, e01 felt a lot like it was trying to channel early-season 'Supernatural' - which I loved until it started getting turned into a children's/YA show. I'm also picking up some 'Witchblade' vibes. Huh, the producers were also involved in 'Lost Girl' and 'Killjoys' - both of which I really enjoyed until I didn't. Not really appreciating the historical liberties being taken (Wyatt Earp never had kids?, he surely never killed that many people, wasn't using a extra-longbarrel Peacemaker), but I gather this is based on a graphic novel series. The other weird feel is that a US Federal Marshall (Dawes)/ "Black Badge Division" being cognizant of supernatural activities - with dual Canada/ US flag emblems on the badge. Pilot's a little rough, mythology is uneven, but intriguing. Melanie Scrofano's got some screen charisma. Music/ score isn't bad. Giving it the 3 episode try.